Warheads are one of the most sour candies around. They come in 5 assorted flavors including Black Cherry, Watermelon, Blue Raspberry, Lemon and Apple. 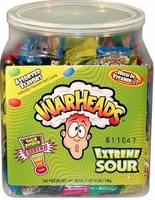 These are a favorite candy for those sour lovers, caution these warheads are mega sour. Don't let the size fool you. Although these hard candies my be small the sour flavor punch is big. Once you pop one of these in your mouth let us warn you . The first 60 seconds are extremely intense, but hang in there. These are sure to make you pucker up! For those of you who enjoy the tangy taste of these, but would rather something not so intense try Warheads Juniors. Same great taste just in bite size pieces. How warheads got their name. It is said that the name came from the fact that these are so sour it is like a real warhead going off in your mouth. The candy itself is sour, however it is the coating on the outside of the warheads that has the intense sour flavoring. At one time there was a hot version of warheads called Hot Torture Scorchers, they came in 6 flavors. They found out quickly that hot was not what was wanted. Now they stick strictly to being sour in the 5 original fruit flavors. Warheads were invented in 1975, but they were not available in the united states until the Foreign Candy Company imported them in the 1980's. Today they are manufactured by Impact Confections. My Reply: HA HA HA HA , that is so funny !!! I take it your staff doesn't like sour candy do they. Oh for the staff you really don't like give them the black cherry I swear they taste like battery acid, not that I have tasted battery acid I can only imagine. I am glad your candy arrived in one piece, have fun with it, I hope they don't curse you to much. He he already made a lovely $50 after betting one of the staff he couldn�t eat 15 at once *he was getting annoying so I took your advice and handed him the black cherry ones! If only you�d gotten to see what happened when he tried to brush the tears out of his eyes with fingers covered in warhead dust.. .. truly truly comical! The bet was originally for $100, but I felt bad after he fell to the floor screaming and gave him half back. Anyway! thanks again, and when this batch runs out you�ll more than likely hear from me again! The moral of this story: If you know anyone who likes sour candy, then warheads are the perfect candy for them; just make sure to tell them not to try to eat 15 at once!